A Hybrid Funds as the name suggests it is fund made up from two different investment instruments namely equity and debt. This means hybrid funds gives benefits of both equity and debt. It offers maximum diversification and moderate return. It is like two in one investment option. Earlier these funds were known as balanced funds. There are multiple types of hybrid funds available for investors. 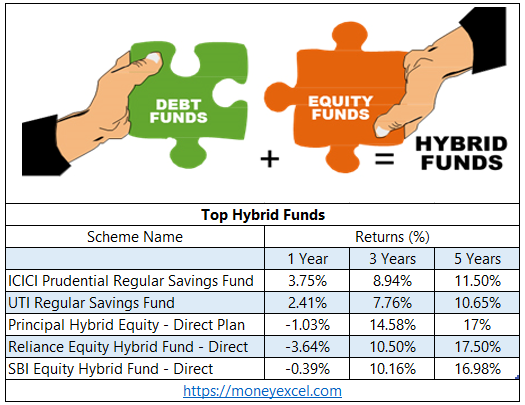 Here is detail information about Hybrid Funds including top Hybrid funds for investment. The hybrid fund works on the balanced approach of investing. The fund manager of fund invests your money in the equity market and debt income instrument as per fund objective. Based on market condition fund manager do a task of balancing. The equity component of the hybrid fund includes equity shares of companies across sectors like FMCG, finance, healthcare, real estate, automobile, capital goods etc. The debt component of the hybrid fund includes fixed income instruments like fixed deposit, government securities, bonds, debentures, treasury bills etc. The fund manager takes buying and selling decision-based on the market conditions. As per SEBI guideline, Hybrid Fund schemes are divided into seven types. The detail definition of each type is given below. Aggressive Hybrid Funds invest 65% to 80% of total asset into equity and equity related instrument and 20 to 35% of total asset in debt instruments. It is an aggressive fund and expected to give higher returns. Conservative Hybrid Funds invest 10% to 25% of total asset into equity and equity related instrument and 75% to 90% of total assets into debt instruments. It is conservative fund recommended for low-risk investors. Balanced Hybrid Funds invest 40 to 60% of total assets into equity and equity related instrument and remaining to debt related instruments. This fund tries to create a balance between equity and debt instrument. Dynamic Asset Allocation fund does investment in equity/ debt that is managed dynamically. This fund is risky in nature. Fund manager expertise plays a crucial role in generating returns via this fund. Multi-Asset Allocation fund invests in multiple assets. As per guideline, this fund Invest in at least three asset classes with a minimum allocation of at least 10% each in all three asset classes. Arbitrage fund follows the arbitrage strategy that means it trades based on prevailing market opportunities. This fund makes at least 65% of total assets in equity instruments. Equity Saving fund makes a minimum investment in equity & equity related instruments- 65% of total assets and minimum investment in debt- 10% of total assets. There are multiple reasons for investing in hybrid funds. Hybrid funds are a safer investment option compared to pure equity funds. These funds provide better return compared to debt fund. These funds are recommended for investors with moderate risk appetite. The equity component of fund offers a better return, at the same time the debt component provide capital protection. There are multiple types of hybrid funds available in the market, you have to be careful in the selection of fund. If you have a low-risk appetite you should go for a conservative type of hybrid fund. If you have higher risk appetite you can go for aggressive hybrid funds. Do you invest in the Hybrid fund? Do share your queries and feedback in the comment section given below.